Watermelon might just be the best summertime fruit. It's refreshing, easily shared and incredibly versatile—it's tasty whether eaten plain, made into sweet sorbet, or mixed into a savory salsa, as in this recipe. This dish combines diced watermelon, ripe plum tomatoes, red onion, jalapeño and cilantro for a simple salsa that's the epitome of summer flavors. Adjust the spiciness to your liking—leaving the seeds in the jalapeño adds heat. Enjoy this delicious, healthy condiment spooned over grilled fish, chicken or steak, as a side for your next taco night, or straight out of the bowl with tortilla chips. This flavorful, low-carb salsa is also very nutritious: watermelon is filled with vitamins A and C and antioxidants. Raw tomatoes are the best source for lycopene, an antioxidant that's been linked to heart health, as well as beta-carotene and Vitamin C.
Per Serving: 6 calories; 0g fat; 1.4g carbohydrates; 0g protein; 0mg cholesterol; 13mg sodium. Its clear that this salsa is a crowd favorite. I am a big fan of different variations of salsa as I have tried avocado salsa, guava salsa, peanut salsa, tamarind salsa and many other salsas. This salsa is so refreshing and definitely one of my favorites. I will certainly be making this salsa a lot going forward. 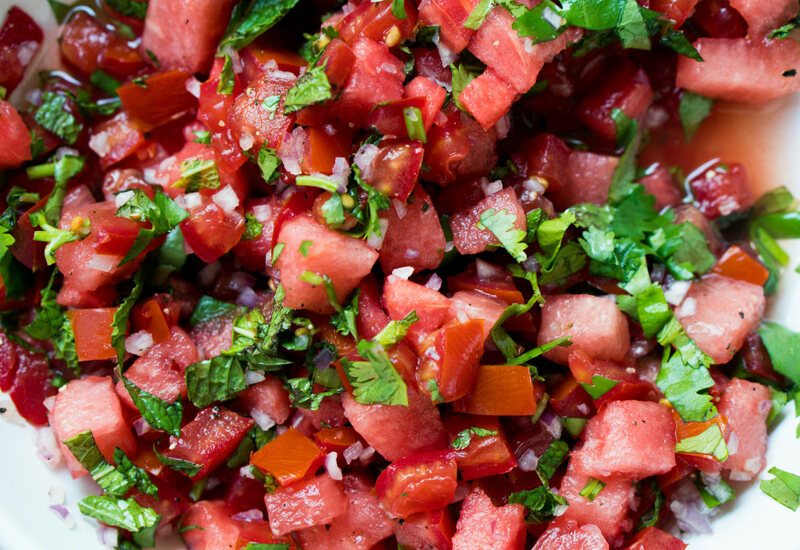 The heat of the jalapeños + the cool, earthiness of the cilantro + the sweetness of the summer's most perfect watermelon = this absolutely perfect summer salsa. I now have a totally new reason to look forward to watermelon season each year! This was so easy to make! It's delicious, refreshing and packed with flavor. I used on tilapia but think it would do great with any other white fish or chicken. Only used half jalapeño because I don't like super spicy but even with half it was too hot. This salsa was amazing on fish tacos! I used mahi mahi and the mix of flavors was delicious! I added a dash of garlic salt to really bring out the watermelon flavor and my husband and I both ended up eating a few bites of the salsa itself because it was so good! An absolute favorite!! I was always a skeptic about watermelon salsa and then this came along! So refreshing; love the heat from the jalapenos that goes so well with the sweet watermelon and popping flavor of tomatoes. Cilantro rounds it out nicely. I tend to use cherry and sungold tomatoes in my salsas, so opted for those this time around. Delicious.